With some of us in the middle of spring break and summer just around the corner, I thought it would be a good time for some more book reviews. Here are some great reads from one of my favorite authors, Diane Chamberlain, a USA Today and London Times bestselling author of 23 novels (click here for the review of my favorite book of hers). I started reading Keeper of the Light, not realizing it was the first of The Keeper of the Light Trilogy, which also includes Kiss River and Her Mother’s Shadow. After I finished the first book, I could not wait to hear what happened to the O’Neill family and I had to read the other two books…I couldn’t put them down. Although they do not necessarily need to be read in order, I highly recommend you do, to better follow the story line. Dr. Olivia Simon is on duty in the emergency room of North Carolina’s Outer Banks Hospital when a gunshot victim is brought in. Midway through the desperate effort to save the young woman’s life, Olivia realizes who she is-Annie O’Neill. The woman Olivia’s husband, Paul, is in love with. When Annie dies on the operating table, she leaves behind three other victims. Alec O’Neill, who thought he had the perfect marriage. Paul, whose fixation on Annie is unshakable. And Olivia, who is desperate to understand the woman who destroyed her marriage. Now they are left with unanswered questions about who Annie really was. And about the secrets she kept hidden so well. Set eleven years after the first book, the O’Neill family finds itself facing new challenges in the form of a stranger obsessed by the old Kiss River Lighthouse. Separated by a continent from her child, Gina Higgins comes to Kiss River with little more than a desperate plan. Now, saving her daughter depends on whether she can uncover a message buried deep below the ocean’s surface. Kiss River’s historic nineteenth-century lighthouse has all but fallen into the sea, taking with it the huge Fresnel lens that once served as its beacon. Gina is desperate to find a way to raise the lens; the glass holds the key to her future, her fortune and her only chance to save the one person who matters to her. Clay O’Neill lives in the old light keeper’s house, a home he shares with his sister, Lacey. When Lacey invites her to stay with them, Gina eagerly accepts. As Gina begins her quest to raise the lens, Clay finds himself drawn to her struggle, and to Gina herself. But the answers lie deep below the ocean. And the lighthouse holds secrets that neither Clay nor Gina can anticipate…. Visiting the O’Neill family once again in the haunting setting of Kiss River, Her Mother’s Shadow tells the story of the adult Lacey O’Neill as she’s thrust into the role of mother before she’s had a chance to truly grow up herself. Annie…A loving mother and wife, Annie O’Neill was the heart of the small community of Kiss River. But her generous nature hid a darker side that remained secret for years after her tragic death. Lacey…When Lacey O’Neill finally learns the shattering truth about the mother she’s spent a decade emulating, the foundation of her life begins to crumble. Then her close childhood friend dies, leaving her teenage daughter, Mackenzie, in Lacey’s care, and Lacey unwillingly finds herself in the role of mother. Mackenzie…Uprooted by her mother’s death, Mackenzie resents her new home of Kiss River. She wants nothing to do with the father who never knew she existed—and especially not her mother’s oldest friend. But the person who could understand her best might be the one she resents most: Lacey. So, I hope I have peaked your interest in these terrific mysteries. Now just pick up a copy of these books, or download them to your e-reader, and enjoy a great read! 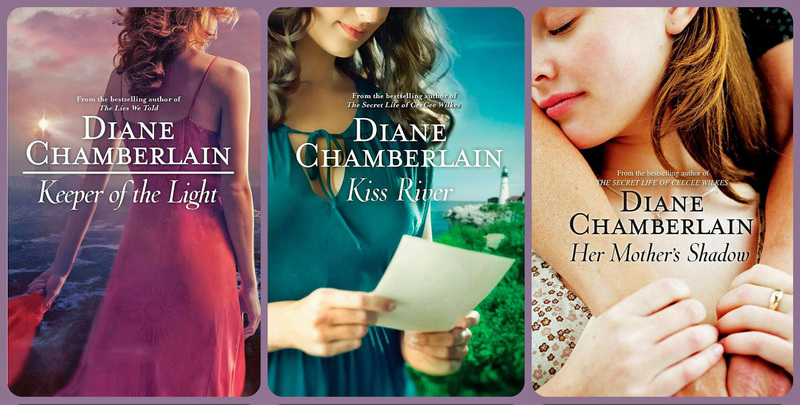 Have you ever read a novel by Diane Chamberlain? If you have, I’d love to hear which was your favorite. « My 1 Year Blogiversary! oh man, i’m going to have to start reading this series!!! those books look awesome! thanks for sharing…sounds like a good book to read! This sounds like a great trilogy to read over the summer. I will have to add it to my book list. These books sound like a great trilogy. I’ll have to check them out next time! Nice, I read so many trashy romance novels 🙂 I am a huge Danielle Steel fan, so this type of story line is right up my alley. These sound like such awesome books to read I love trilogies. These look like amazing books! I need to get this series asap! I hardly ever have time for a good read but I need to change that. This is a great series to get me started. I know a friend who might love this genre. The plot looks interesting. Thank you for sharing this. Sounds like an interesting book to read. I never read Diane Chamberlain books before. But this seems to be a great one and I love the trilogies one. Will have to check this out for summer read. Thanks for sharing. They look interesting, I’m usually not much of a mystery reader, but these might be worth checking out. Do me some good to step out of my sci-fi/fantasy box. I think this is the author my sister-in-law was talking about at Easter. I’m going to ask her. How funny to not hear of her and now hear of her twice in such a short time. I had that happen with something else today too! I am always seeking great books to read. Summertime is coming and I would love to add these too my summer reading list! All the books look like potential great reads for lovers of mysteries. I enjoyed reading your reviews and might pick up a copy. All of these sound pretty interesting! I love a good mystery book. I need to check them out! Ooh book teasers are fun and a great way to find some beach reads! Thanks for linking up with us at MeetUp Monday! Hope to see you again this week! These are good reads, especially the first one, keeper of the lights!